Life goes on after the barrage of media attention last week in the Chronicle and my 15 minutes of fame. I actually feel that some good came out of the article and that it got some people inspired. Just this morning I learned about some church in Napa Country that has a lot of open land “and the man who is responsible for the grounds loves the idea [of planting gardens on Church property and giving the food to needy families in the community]. 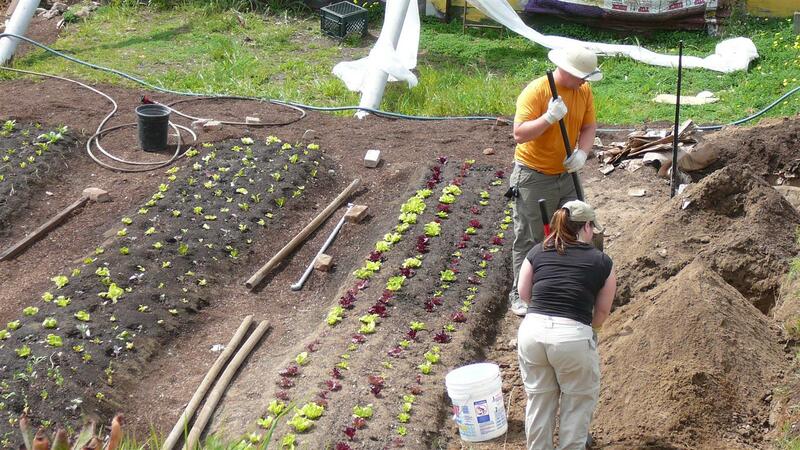 What I have been thinking about is how do we attract volunteers that are in it for the long haul for the all the local food growing projects currently going on? How can we get people, most who have to work at jobs in the unreal world to pay rent, to make a long term commitment to one garden project? I feel like there have been some real successes like at the Secret Garden where Clara and others have really kept that garden going and made it a vibrant space that serves the community. I just got these photos from last week where kids from Cesar Chavez Elementary School after shool program visited the Secret Garden. Projects like the Hayes Valley Farm, which is on the high profile radar these days, get a lot of volunteers on their workdays, but recently the number of volunteers at 18th and Rhode Island Sts. has gone down. One factor that may be key is that it is easier for people to work on something that is nearby or in their neighborhood. I have been a big advocate of working as locally as possible. For example, for years I lived in a community that grew a garden open to the public that was right next door to our house. Two years ago I started the Free Farm Stand and looked for gardens in my neighborhood to grow food for the stand in. 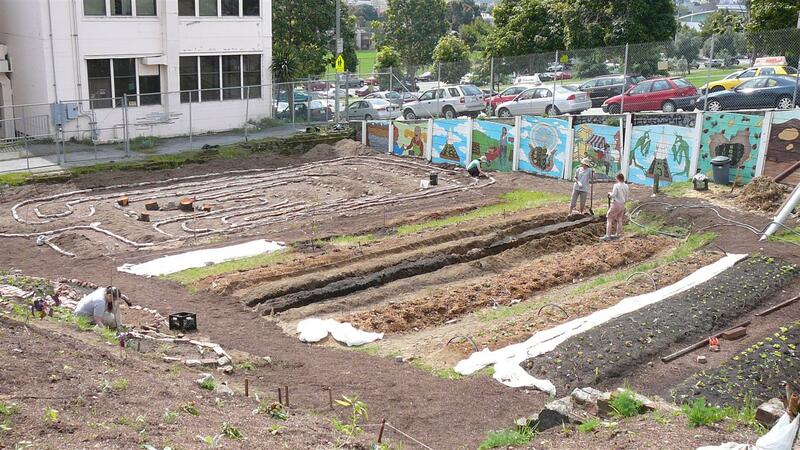 The best opportunity that came up sometime later was on a vacant lot on Potrero Hill, and I started working with the Permaculture Guild in developing the site into a garden. Now I am even further from my neighborhood at the Free Farm not too far from Civic Center in a neighborhood that seems to need a free farm stand as much as the Mission. I am starting to find it challenging and puzzling how to stay local myself and self-sustaining. It feels like I am walking a thin line these days in terms of keeping it all together. The Free Farm Stand days continue to be wonderful though and I continue to appreciate all the wonderful souls that pass through like rays of sunshine warming me up. by On Saturday Pancho brought to the Free Farm three fabulous women from a community of 35 in Sebastopol. Two of them and Pancho stayed the night at our place and helped load the van and then helped at the stand all day. We both shared some of our experiences living in community and I am convinced that is our next step in this evolution, like I mentioned before in a previous post, the formation of an Urban Kibbutz/Farm. Other new volunteers showed up like Corinne and mMingpha (he told us it means Blissfully Breathing, Absolutely Healing). I love it when I meet angels like him who have turned away from earning money and are trying to live like a pilgrim. It was also a very colorful stand this week, Pam from her City College garden brought by beautiful edible flowers for a salad, a handful of lavender flowers that we gave to as many people as possible, some red mustard, miner’s or Indian lettuce, and some colorful chard. Cristina brought by flowers too. Zach brought by some nice greens also to add to the record amount I harvested from 18th and Rhode Island. Clara brought some greens from the Secret Garden, and we had two people picking stuff from Treat Commons Community Garden next door to the stand. We also had a nice selection of Meyer lemons from neighbors. I was excited that I actually got it together to grow a bucket of sprouts this week. Look for my upcoming cartoon on growing sprouts. I am still working on how to post it. A number of people were looking for starts and I feel bad that I have been way behind in growing them. A greenhouse will help and we are working on getting one set up soon. I would love to encourage anyone who has a source for local flowers to please bring some to share next Sunday. Our work day at the Free Farm was another great thing. I was so busy I didn’t even pull out my camera to try to capture some of the magic happening there. It may take some time before we grow good soil there let alone produce. Some of the lettuces are growing big and this small amount of rain will help nourish the other greens in the ground. 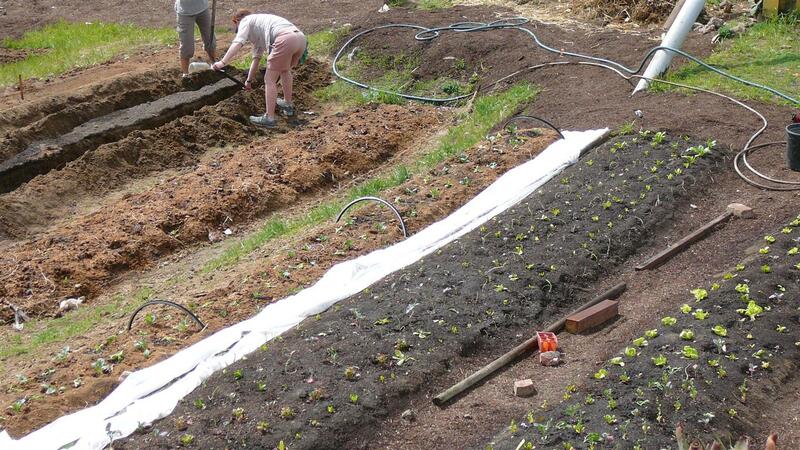 We have been covering the planted beds with row covers which should also help. A few more fruit trees were planted as well as some other perennials. I think this Wednesday a bunch of kids from Children’s Day School will show up (unless it is raining) and we have a newly finished bed to plant carrots. We also have some newly donated large planter boxes that we can fill with soil and I have some things to plant in them that can grow against the fence. On Sunday the Hayes Valley Farm was having a Volunteer Appreciation Day and I heard it was a big success. I was celebrating “Everyday an Appreciation Day”. It seems I can’t help it. appreciation for all the new people and neighbors I meet in the work I do: like Wiley the mechanic who has dropped by the Free Farm and has been farming with us. He likes to fix things…he has been tackling our funky wheelbarrows with tools that a volunteer had in her car (and this week he said he would bring more tools for fixing tires). Other news besides me feeling appreciative is that I got a call today from a friend that I was written up in the Chronicle. I was interviewed on Wednesday at the Free Farm and a photographer was out Sunday. I have such mixed feelings about granting interviews especially with corporate media and this is the first time I have really plunged into that world of publicity. The main thing that came to mind when I thought about it is that we got the Permaculture Guild farm on Potrero Hill because of an inspiring article about Kevin in the Chronicle talking about all the vacant lots that could be used for growing food. Just now channel 2 T.V. called me and wants to talk to me because of the article. Wow this is crazy! A friend whom I hadn’t seen in a year dropped by and made me feel better by saying they would interview the farm if it could talk, so I am speaking for it. But the farm and the Free Farm and the Free Farm Stand do talk and I don’t really have to say much if people just show up and check things out. I must say the Free Farm is pretty exciting for me and every week we make great leaps forward. We are finding some large chunks of rubble under the ground that are challenging to move out of our beds. Potatoes have been planted, our lettuce mix bed has sprouted, we have several more beds left to plant, seedlings are growing happily in our makeshift green house, a trellis has been made over the steps and we are almost ready to plant my collection of Scarlett Runner Beans, and the labyrinth is shaping up. We also have an amazing work crew and neighbors showing up to help, some bringing their kitchen scraps for our compost, some bringing seeds for us to plant. I also love the variety of people that show up every week. On Saturday I met a woman who lives in the big white apartment building down the street that wants to put a bee hive at the space. She has taken care of silk worms before and wants to work with bees. She is also an amazing artist who gave me her card made on handmade paper and printed on a Vandercock letterpress that she knows how to use. With all the hub bub around the new Free Farm, I need to mention that the farm at 18th and Rhode Island is still producing most of the produce for our hecka local table and is still looking great. The photos Cristina took this Friday workday are amazing in capturing the colors there. And now we have two hives and bees living on site. I am getting there earlier now at 9am unitl 11am and David is there at 11am if you want to join us. Then I hoof it over to Treat Commons another great garden that needs attention too. He needs a greenhouse to grow the flats of seeds in so we have been talking about building a temporary green house at the farm. If anyone has ideas on how to do this cheaply and quickly or has materials that may help like rolls of plastic or pvc pipe please contact us asap. You can also contact him directly here victoryfarmer.blogspot.com and check out his other projects that you can get involved in. I am also looking for help on Thursday afternoon taking apart a tree house and moving it to the Free Farm to be used for a secret purpose. Call me for more information.